Synergistic blend of nutrients appropriate for the maintenance of healthy and joints, together with an array of botanicals. Vitamin C plays an essential role in numerous areas of human health. Vitamin C contributes to normal collagen formation for the normal function of bones, cartilage, skin, gums and teeth. Vitamin C also enhances iron absorption and the normal energy-yielding metabolism. Vitamin C aids in the maintenance of the immune system including during and after intense physical exercise. Vitamin C contributes to normal psychological function and the functioning of the nervous system. Manganese contributes to the normal formation of connective tissue and aids in the maintenance of normal bones. Manganese and vitamin C also have a role in the protection of cells from 'oxidative stress'. This oxidative stress appears to be a major factor in many human diseases. A vegan glucosamine using the highly accredited glucosamine sulphate 2KCl. 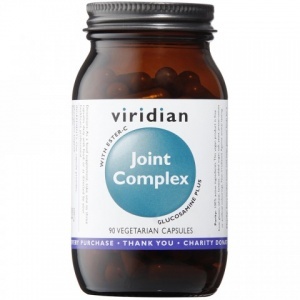 Take daily alongside Viridian's Joint Omega Oil for the optimum in joint health nutritional support. Glucosamine (vegan) 500mg, Vegetarian cellulose capsule 120mg, Boswellia 50mg, Ester-C TM 50mg, L-Proline 50mg, Turmeric 25mg, Quercetin 25mg, Bromelain (1200 gdu/gm) 25mg, Ginger Root 25mg, Manganese (Ascorbate) 1mg, Providing vitamin C 6mg.